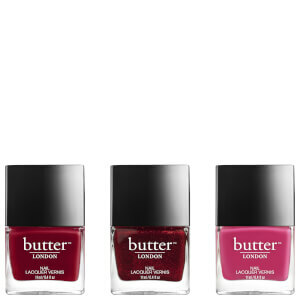 Combining three shades of the brand's vitamin-rich Trend Nail Lacquer, the butter LONDON London Calling Set allows you to create salon-worthy results from home. Infused with nourishing Horsetail Extract and Hydrolysed Silk, each nail polish glides on effortlessly with even, one-stroke coverage; it promotes stronger, healthier nails, whilst delivering long-wearing, chip-resistant colour with mirror-like shine. Saucy Jack: Butyl Acetate, Ethyl Acetate, Nitrocellulose, Acetyl Tributyl Citrate, Adipic Acid/ Neopentyl Glycol/ Trimellitic Anhydride Copolymer, Isopropyl Alcohol, Styrene/ Acrylates Copolymer, Stearalkonium Bentonite, Silica, N-Butyl Alcohol, Benzophenone -1, Diacetone Alcohol, Trimethylpentanediyl Dibenzoate, Polyethylene, Phosphoric Acid, Ascorbyl Palmitate, Tocopheryl Acetate, Calcium Pantothenate, Glycerin, Equisetum Hiemale Extract, Hydrolyzed Silk, CI 15850 (Red 6 Lake), CI 15850 (Red 7 Lake), CI 15880 (Red 34 Lake). Chancer: Butyl Acetate, Ethyl Acetate, Nitrocellulose, Isopropyl Alcohol, Polyethylene Terephthalate, Adipic Acid/Neopentyl Glycol/Trimellitic Anhydride Copolymer, Acetyl Tributyl Citrate, Silica, N-Butyl Alcohol, Styrene/Acrylates Copolymer, Polyurethane 11, Benzophenone-1, Ascorbyl Palmitate, Tocopheryl Acetate, Calcium Pantothenate, Glycerin, Equisetum Hiemale Extract, Hydrolyzed Silk, CI 19140 (Yellow 5 Lake), CI 15850 (Red 7 Lake), CI 15880 (Red 34 Lake), CI 77000 (Aluminum Powder), CI 77007 (Ultramarines), CI 60725 (Violet 2). Primrose Hill Picnic: Butyl Acetate, Ethyl Acetate, Nitrocellulose, Acetyl Tributyl Citrate, Adipic Acid/Neopentyl Glycol/Trimellitic Anhydride Copolymer, Isopropyl Alcohol, Styrene/Acrylates Copolymer, Stearalkonium Bentonite, Silica, N-Butyl Alcohol, Benzophenone-1, Diacetone Alcohol, Trimethylpentanediyl Dibenzoate, Polyethylene, Phosphoric Acid, Ascorbyl Palmitate, Tocopheryl Acetate, Calcium Pantothenate, Glycerin, Equisetum Hiemale Extract, Hydrolyzed Silk, CI 77891 (Titanium Dioxide), CI 15850 (Red 6 Lake), CI 15850 (Red 7 Lake).